Ald. 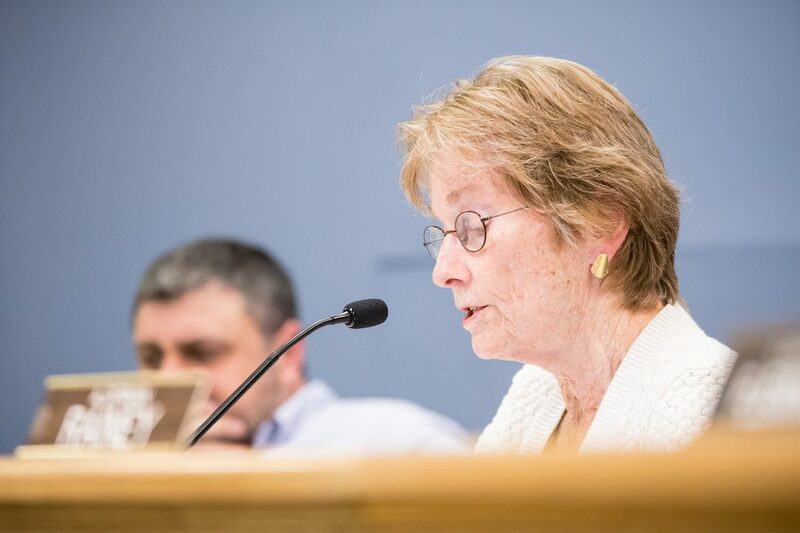 Eleanor Revelle speaks at a City Council meeting. Revelle advocated for allowing non profits to submit proposals for the 2222 Oakton St. during the new qualification/request for proposal process approved on Monday. City Council approved a resolution terminating the lease between the city and Smylie Brothers Brewing Co. at 2222 Oakton St. at a Monday meeting. Aldermen voted 5-2 to pass the resolution with Ald. Thomas Suffredin (6th) and Ald. Cicely Fleming (9th) voting against the resolution. The 10-year lease between Smylie Brothers and the city was approved in January 2017. In April 2018, company owner Michael Smylie wrote to the City Council asking to be let out of the lease because of a lack of funds. Action on terminating the lease of the former city recycling center was delayed due to negotiations with the Smylie Brothers until Monday’s meeting. According to city documents, Smylie Brothers has agreed to pay the city $48,292, which is three months rent of the property and a portion of utility charges for the building since January 2017. The payment does not include the $10,000 requested by the city for anticipated liquor tax revenue, which is still being discussed. Smylie Brothers also agreed to give the future tenant or owner of the property “due diligence documents” to reduce the inspection period estimated at about $20,000. When Smylie Brothers entered the lease in January 2017, the city granted the company 18 months of occupation rent-free to allow construction. If the lease was not terminated, Smylie Brothers would’ve paid their first month of rent on July 1. Suffredin agreed with Fleming about returning to negotiations with Smylie Brothers. The city will now move forward and accept qualifications/requests for proposals for the 2222 Oakton St. property. City Council passed the resolution 6-2, allowing city staff to begin the process of accepting proposals. During the discussion in the Administration and Public Works meeting before City Council, Ald. Ann Rainey (8th), raised some questions about the guidelines for applicants. Rainey said she was against selling the property before because the city could lose control of the building. Rainey added that if a buyer bought the space and decided the space didn’t fit their plans or needs, then the city would have no control over a new buyer. She said that a lease or a lease-to-own would be the best option for the property. According to city documents, the current qualifications/request for proposals process allows the option to buy or lease the property. It also requires information be submitted regarding proposed sales and property tax contributions. All proposals are due August 10. During City Council, Ald. Eleanor Revelle (7th) said she wanted to allow non-property taxed entities to submit proposals to the city. City Council previously discussed only allowing tenants who pay property taxes to apply in a June meeting.